May is designated National Celiac Awareness Month, and Fleming’s Prime Steakhouse & Wine Bar (25 E. Ohio St., Chicago; (312) 329-9463 and 960 Milwaukee Ave., Lincolnshire, Ill.; (847) 793-0333) wants those who have celiac disease (CD) to enjoy a meal out without the concern over their dietary restrictions. This is a great time for diners who are simply considering a gluten-free lifestyle to let someone else do the cooking. “As the executive chef of Fleming’s, I take our guests’ dietary needs as seriously as they do,” says Fleming’s Executive Chef Russell Skall. “This is why we have such an extensive gluten-free menu without a lot of substitutions required. We want our guests to experience what eating at Fleming’s is all about by enjoying all of the great flavors offered with our appetizers, salads, entrees, sides and tempting desserts. Because we make everything from scratch, our chefs can ensure that every meal is the best it can be,” he adds. Fleming’s offers guests a gluten-free menu which is also available online. Upon arrival at the restaurant, guests are advised to tell their servers that they are ordering gluten-free. Numerous appetizers can be ordered as they are indicated on the menu, such as the shrimp cocktail, butternut squash soup, cream of asparagus soup and lobster bisque. Other dishes can be customized for a gluten free experience. Appetizers like the tenderloin carpaccio, wicked Cajun barbeque shrimp and seared ahi tuna can be ordered without croutons, bread or mustard sauces to make the dish gluten-free. 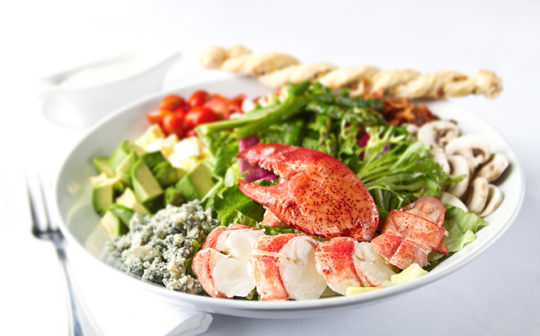 Most salads may be ordered without croutons; while others such as the lobster Cobb and filet mignon Cobb can be made gluten-free by removing the puff pastry and substituting the dressing (all salad dressings are gluten-free except the red onion balsamic dressing). Dinner entrees like Australian lobster, tuna mignon, Alaskan king crab and any of the meat selections can be ordered as is for a gluten-free meal. Other seafood dishes like the barbeque Scottish salmon filet and the seared scallops can be adjusted for guests with a gluten-free diet. No meal is complete without sides, so Fleming’s ensures there is a selection of side items for everyone. On the dinner menu, gluten-free sides include baked potato, Fleming’s potatoes, green beans, mashed potatoes, sautéed spinach, sautéed mushrooms and grilled asparagus. Fleming’s even satisfies every sweet tooth with several gluten-free deserts: crème brûlée, mixed berries with whipped cream and vanilla ice cream with raspberry or fudge sauce. About Fleming’s Prime Steakhouse & Wine Bar The nationally acclaimed Fleming’s Prime Steakhouse & Wine Bar offers the best in steakhouse dining – Prime meats and chops, fresh fish and poultry, generous salads and side orders—with a unique wine list known as the Fleming’s 100, which features over 100 wines served by the glass. Fleming’s was launched in Newport Beach, California in 1998 by successful restaurant industry veterans Paul Fleming and Bill Allen. Today there are 64 restaurants nationwide. Fleming’s is the recipient of numerous prestigious awards, including Wine Enthusiast’s annual Award of Distinction and Wine Spectator Magazine’s Award of Excellence. For more information about Fleming’s Prime Steakhouse & Wine Bar and the Fleming’s 100, please visit http://www.flemingssteakhouse.com/.